The arrival of a new recording of Giuseppe Verdi’s Otello into the catalogue, to say nothing of a new tenor capable of singing Otello, is generally cause for hosannas all around in operatic circles. The knife-sharpening tends to start a little later. In today’s age of performances captured live, either for audio or video, I think we have to cast back nearly 20 years for the last time a recording company invested in studio time for what Verdi and his librettist Arrigo Boito dubbed ‘the chocolate project’ for the sake of confidentiality in their letters. Our friends at Pentatone are to be thanked for this new traversal of Verdi’s late career masterwork which reunites the cast of their 2014 recording of The Little Match Girl by Gordon Getty (!) adding the esteemed conductor Lawrence Foster and the forces of Lisbon’s Gulbenkian Orchestra and Choir. Maestro Foster will probably be best remembered for his star-studded recording of George Enescu’s Oedipe on the EMI label with Jose van Dam which remains a touchstone for that magical and challenging 20th century work. If the liner notes are to be taken literally everyone involved here, the three leads and the orchestra and choir, are performing their roles for the first time which, naturally, gives one pause. Pentatone, being the Cadillac of recording companies, lays on the deluxe cardboard cigarette case packaging with cover art representing Shakespeare’s Moor from 19th century painters on the interior sleevelets and a fat booklet with glossy pages that not only provides a brief essay on the work being presented but a full Italian/English translation and (gasp!) artist’s biographies. The fact that these bios stray into the weeds of hyperbole from time to time is cause for mild amusement, as for instance when the soprano in question is compared favorably to Renata Tebaldi and Gabrielle Tucci. All this printed with the kind of ink and deluxe paper that reminds me of the contact high I used to get when I opened a new opera box set from Deutsche Grammophon and got the first whiff of all those petroleum products. The thing that Pentatone is most known for is their authentic audio engineering and this release proves no exception to that rule. Every orchestral, choral, and vocal detail is Direct Stream Digitally rendered up here for our listening enjoyment in the most pristine aural environment imaginable. The expanse of the sound pictures and the breadth of the orchestral and choral vibration captured here is no doubt a significant technical achievement. Whether this performance warrants this kind of microscopic, and some might say clinical, preservation is another matter entirely. We get off to a strong start with the storm scene with some very vivid orchestral attacks. The strings are split on both sides of the podium and you can hear them specifically left and right in the opening pages. Couple this with some discreet storm effects and just the right amount of bass fiddle droning on underneath it all (a masterful atmospheric effect on Verdi’s part in the theatre but one that can be overemphasised in the recording studio (…and has)). The chorus starts hushed and frightened but then as the scene builds so do the Gulbenkians. At the first massed climaxes they do sound a smallish group though and unacquainted with the robust caterwauling that an Italian opera chorus needs to make in the opening pages of Otello. That said their sound is so gloriously homogenous and their diction so clean that you could take dictation from them which is certainly refreshing. Our new Otello makes his entrance with all the requisite fanfare and we are presented with Austrian tenor Nikolai Schukoff who has been steadily making a name for himself in Europe after his big breakthrough as Siegmund in a revival of the Valencia Ring in 2006. Mr Schukoff sings the “Esultate!” well enough. He has a clean cornet of a tenor with little baritonal resonance on the bottom. There’s more than a hint of excitement and a catch in the throat but he does remain almost completely on pitch…and we’re off. Mr. Schukoff makes a fine Moor if more in the Germanic tradition than the Latin. He’s tender during the love duet and builds his responses to Jago’s treachery in Act II carefully so as not to become wildly overwrought by the curtain. His tone is perhaps leaner than we’re used to but he pours on the drama when necessary even ending “Dio mi potevi” with a surprisingly guttural plunge downward on the final”‘O gioia!” that suggests the taste of blood. Lester Lynch bills himselfs as a baritone but his Jago sounds more like a bass sent to do a baritone’s job, with a dark core that unfortunately tends to loosen under pressure. To my mind there are two kinds of Jagos: the subtle schemers and the blunt force traumatizers. Mr. Lynch falls into the latter category. In the Act I drinking song he clips the high note on “Beva!” (and he’s certainly not the first) but the trick is to sound like you’re doing in intentionally not managing. He muscles his way through the Act II “Credo” and ends it with a magnificent demonic cackle. The bones are all there and it’s certainly a role he will continue to grow into. The voice, despite its inherent beauty, maybe a tad too monochromatic for Verdi’s most cunning villain. Then after the brouhaha in the port the fair Desdemona is awakened and suddenly it’s clear why we’ve been called to Cyprus. Melody Moore made a surprise San Francisco Opera debut in Act II of Tosca in 2012 after Angela Gheorghiu became indisposed in Act I.
Ms. Moore carried on to triumph and has since garnered acclaim in a very, very, wide repertory all the way from Rufus Wainwright’s Prima Donna to the jugendliche Wagner roles of Freia and Senta. She has been praised on these pages for her Lady Macbeth at Glimmerglass and in the Houston Grand Opera production of Mieczyslaw Weinberg’s The Passenger which travelled to the Park Avenue Armory in 2014 as part of the Lincoln Center Festival. She sings almost all the Puccini. She credits Carol Vaness as one of her early mentors and they share a similar refulgence of tone. Truth be told Ms. Moore does indeed sound like she might have stepped out of a time machine from the 1950’s (liner notes be damned) Her rich merlot-tinged soprano is full of old school goosebump-inducing quality as is her abundant breath control. Her Italian vowels are beautiful and if her r’s are occasionally over-rolled I forgive her. Ms. Moore is radiance itself during the love duet. Alert and fiery during the two interviews with Otello and caps her performance with a stunning Willow Song where her asides to Emilia are particularly vivid. Perhaps the very last modicum of word pointing is missing from her performance I’m sure it will come with time since there’s already so much polish here. Maestro Foster leads strongly, if perhaps carefully at times, and it’s not what I’d call a red-hot performance but there is smoke and fire and all of the big moments land where they should. Since the Lisboetas are all playing and singing this for the first time there is a palpable freshness to the performance and a complete lack of routine. I’m going to blame the expansive engineering for the lack of big orchestra punch at some of the climaxes but there are moments like Otello’s Act IV entrance into the bedroom where the bass fiddles usually dig in deep and here they certainly play strongly but still very (read:too) beautifully. 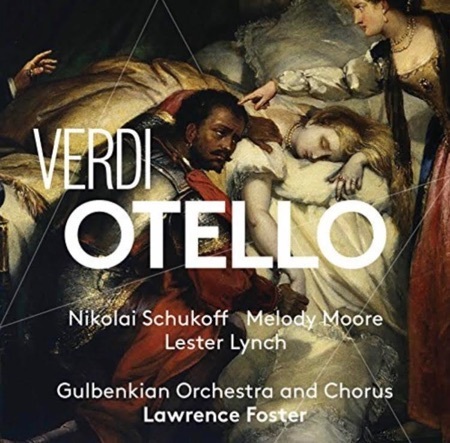 The litmus test for sonics on any recording of Otello is the Act II quartet over the handkerchief and here the two couples are well separated and you can make out every word they sing. Oddly though in the last Act there’s no difference between Emilia’s calls of “Aprite!” from outside the door to Desdemona’s bedroom as when to then when she enters the room. I should mention here the excellent Emilia of Helena Zubanovich and a strong supporting cast. I don’t know what the acoustic at the Grand Auditorio of the Calouste Gulbenkian Foundation is like but there’s not a drop of juicy reverb here to speak of which may be another problem. The teenager in me who prized digital sound above all else was certainly sated with this very good performance with a lot of promise for the future on all fronts.